Pecan pie is one of those things people are sooooo opinionated about. I don't mind whether it has more nuts or more filling, whether the texture is just right or a little too stiff or a little too runny. There are only two things I really care about--I don't want shortening (or lard, for that matter) in the crust, and I don't want corn syrup in the filling. I simply cannot ingest those horrible things. So, you see, I'm not opinionated at all! I developed this pecan pie recipe to suit my husband--you see, he has "texture issues." You might find it too heavy on the nuts and light on the filling, but that's what he likes. And it has significantly less sugar than most. So if you're one of those people who doesn't eat pecan pie because it is too sweet, this one might change your mind. For those who like to eat with the seasons, pecan pie is the quintessential autumn pie. And it doesn't take a lot of time to make, especially if you make your pastry ahead of time and refrigerate it (for a few days) or freeze it (for a few months). I usually have a few disks of pastry in the freezer. Then I just move one or two to the refrigerator the day before I'll be making a pie. Update 12/01/16: Try my Gluten-Free Pie Crust and Pecan Tart - Without Corn Syrup. 1 Preheat oven to 400 degrees. Get pie shell ready and keep it in refrigerator until filling is ready. In 2-quart Pyrex glass measure, melt butter in microwave. Add brown sugar, sugar and salt to warm melted butter; mix well. Add hot water, stirring until sugar is dissolved (mashing out any lumps), and maple syrup. Add eggs and vanilla; mix well, until mixture is very smooth. Stir in pecans. Pour into pie shell. 2 Bake at 400 degrees for 10 minutes. Lower heat to 350 degrees and continue baking for about 30 minutes, or until center of pie puffs up and a toothpick inserted in the center comes out clean. The center should feel set yet soft when pressed lightly. 3 Cool on wire rack at room temperature for at least 4 hours. If you make it a day or two ahead, refrigerate it until 2 hours before serving time; allow it to come to room temperature. Or warm at 275 degrees for 15 minutes before serving. Cut into 8 wedges and serve with a dollop of unsweetened or barely sweetened whipped cream or a scoop of vanilla ice cream. 1 With metal blade in place, add flour, salt and baking powder to work bowl of food processor. Turn on for three seconds to combine. Add half the frozen butter and process for 10 seconds or until mixture has the consistency of coarse meal. Add remaining butter and pulse for six 1-second pulses, or until the frozen butter is the size of small peas. 3 Turn dough out onto a piece of plastic wrap and flatten slightly into a 4-inch round disk; double wrap; refrigerate for at least 30 minutes or up to three days. (Let thoroughly chilled dough stand at room temperature for 15 minutes before rolling.) Place in 9-inch Pyrex pie plate and keep in refrigerator until filling is ready. * I have the DLC-10E, which (understandably after all this time) is no longer available. See Cuisinart DLC-2009CHB Prep 9 9-Cup Food Processor, Brushed Stainless and other currently available models. Hey Jean, excellent! Pecan pie without the corn syrup. We are going to give this a try. Our personal favorite is Pecan and Macadamia pie, so we'll make one using your no-corn-syrup recipe! Thanks, Grant! You are from the home of macadamias, so of course you should use them in every way you can. Sounds good! As for lighfing forks, the standard reference work I used on my BBC lighting courses was called Light, Science & Magic by Hunter & Fuqua. Once you have grasped their notion of t"he family of angles", you're well on your way to setting up shots that work every time. I'll have to look into that, Peter. Believe me, it was almost purely by accident that I got the reflection on the fork to look so good! I also have "texture issues" with almost all of my food, so I found that really amusing! I love pecan pie ~ might have to try this one sometime. Though, I still haven't mastered making my own pie crust quite yet. Thanks for stopping by, Mary. And, since you have texture issues, be sure to come back next Friday for another post for you texturally challenged people. 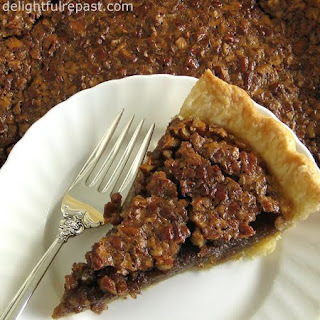 Pecan Pie is one of my husbands favorite pies - yet I never think to make it until Thanksgiving! Thank you! Lots of people only make pecan pie and pumpkin pie for Thanksgiving. I don't know why, 'cause I love them all the time, but especially in fall and winter. Corn syrup is not a regular grocery or baking item we can get here in Germany. I am so glad to read that maple syrup was used make the filling, which must have made the pie extremely delicious. Thanks, Jean, for sharing this recipe. Angie, thank you. And I wish I could say "corn syrup is not a regular item that WE can get HERE"! Thank you, Greg. Everyone should have at least one Southern grandmother! Thanks for sharing one of her sayings. Thanks, Michelle! People in Texas have to like pecan pie, don't they?! Being utterly without taste, I just sort of mainline pecan pie with a hypodermic needle in any available body part. Okay. Kiddin'. Thanks for sharing this delicious recipe as well as engaging glimpses into your family life. Sully, thanks! I like that--"engaging glimpses." Sounds so much better than "airing our dirty laundry." Jean, I LOVE that you are a picky pie maker, so all I have to do is follow your directions. We love pie. And pecan pie is my father's favorite. I suspect he'll be asking for some the next time he pops in. I'll have to try your recipe and test it out on him. Kim, I like that--I'm a "picky pie maker." I do give a lot of directions, but better to give too much info to an experienced baker than not enough to a beginner, right? Oh Jean, I love pecan pie and I'm not Southern! :D But this more nutty and less sweet version is like a dream come true. I love pecan pie but have always thought it was too sweet and not enough nuts. I'm gonna keep this recipe in the files! You rock! Thanks, Madison! I hope you like it. After you've tried it, do let me know. Seems like something that would be a good reward after running a marathon. Well, I'm from Texas, and all I can think to say is, it's raining cats and dogs and I just stepped in a poodle of corn syrup). I am a great lover of pecan pie and hater of corn syrup (although I make my pecan pies with it). I am thrilled to find your alternative. Thanks! I'm so glad, Adair! I really hope you like it so you will never need to buy a bottle of the foul stuff (corn syrup) again! Thanks, Anna! Hope your "odd" guy likes it as much as my "odd" guy does! Beautiful looking pie, Jean and one that we don't see very often here in Australia. I much prefer pecans to walnuts and put them in loads of dishes - sweet and savoury. Amanda, thank you. I love walnuts, too, but pecans seem somehow more "special" to me. Maybe because I eat a handful of walnuts or almonds every day for health purposes. Okay, my opinion on pecan pie, because yeah everyone has one-I'm with you no lard, no shortening in my crust. Thanks, Naomi--I think!? I know a lot of people are still eating hydrogenated shortening, and I think it's just plain scary! Hello, Jan Fredrik! Thanks for stopping by. It might be kind of a heavy dessert to follow the boeuf bourguignon. But do give it a try and let me know the results. It makes me so happy to hear you say that! And, yes, this pie is definitely birthday worthy! You'll have to let me know how you liked it. hi there, I was going to use your amazing recipe for thanksgiving, but i also noticed that although you mention maple syrup in your list of ingredients, it isn't mentioned in the directions...do you mix it in with the sugar and brown sugar? Nongtipa, thank you so much for telling me that! So much for my own proofreading! I'm going to make that change now. Yes, you mix it in with the sugar and brown sugar. Alright! :) Once again, thank you very much for your corn syrup-free recipe. Update: This was the easiest pie I've ever made :)! No complications, easy to follow directions, and the end result is SUPER delicious! (Not too sweet either!) I am definitely going to have to make this for my mum....she will love it! Thank you thank you thank you for sharing! Nongtipa, thank you soooo much! That is the most glowing comment I've yet to receive on my blog! My goal is always to write down the recipes I develop in the clearest possible way so that you will have a good experience, and it really pleases me to hear that you found it easy to follow and had no complications. Hello, Anonymous, sorry the recipe didn't turn out well for you. I must say, though, that if made strictly according to my directions the one thing this pie will NOT be is runny! So I suspect there was some deviation. Or perhaps your oven temperature is off (that happens a lot and can be fixed). It IS very sweet, even though less sweet than most pecan pies, and should be cut into very small servings. Kimberly, I'm so glad you liked my recipe. Thank you so much for letting me know! Isn't pie just the "homiest" dessert? Thanks so much! I'm so glad he likes it. I call it Maple Walnut Pie when I use walnuts instead of pecans. Thank you for this. I love pecan pie, but know that the corn syrup isn't good for us. now I can make one without so much guilt about eating it afterward. Going to Flip this so I can find it easily again.